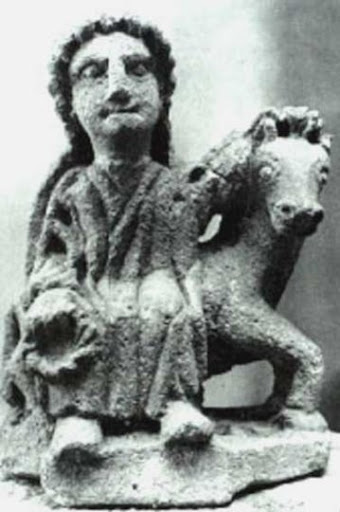 EPONA is the Gaulish Goddess of horses, donkeys, and mules. Her worship was adopted by the Roman army and they spread her cult throughout the empire. Epona is usually depicted sitting on a horse or standing with horses around her. She holds a loaf of bread or a horn of plenty, showing that she is also a fertility Goddess. Epona's name means "great mare" and she was also known as EPANE in Spain. The many inscriptions on statues dedicated to her (mostly in Latin) also call her EPONA REGINAE (queen), EPONINA (dear little Epona), ATANTA, POTIA, CATONA, DIBONIA, and VOVESIA.